It is mandatory that, before the first usage, you configure the basic settings regarding the extension. For doing this, go on the upper menu on Components/Micro Deal Factory/Settings. Choose the desired Date format which will be used in the templates: “d” stands for Day, “m” for Month while “Y” stands for year. You can define how many Deals per page there will be displayed in the listings, how many Comments per page will be visible, as well as the Earnings per page value. Exceeding values of these 3 will create pagination in that respective section to display all the deals, comments or earnings. For each deal, users can set a description of the one they are creating. With Length short description you can set how many characters will be displayed on listings from the initial description. With Display sidebar enabled, users will be able to navigate through the available categories using the sidebar, which will be displayed on the right side of the listings. A search bar will also be displayed on it. You can set the sizes of the images from here as well. There are 2 sizes for images, small ones, which will be displayed on listings, and medium ones, which will be displayed in the detailed view of the deals. For both of these types you can define their Width and Height. Sellers can be promoted to 3 different levels according to their amount of processed orders. 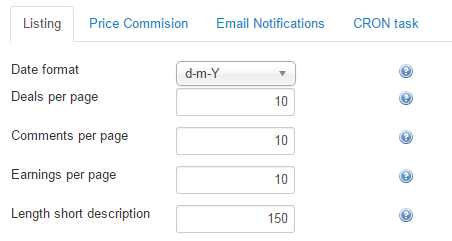 From here you can modify the amount of orders needed to promote for each level. With Require end date enabled, the end date field will become compulsory for users when adding new deals. In case this is disabled and there is no date set on new deal, an unreachable date will be set for unlimited publishing. On the Admin Instruction text field enter the instruction and guidelines for buyers, information which is needed after any purchase. 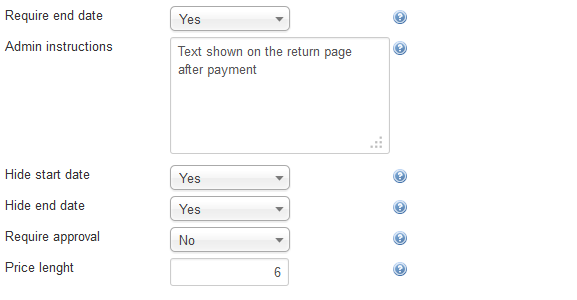 This information will be displayed on the payment-return page. The Hide start date and Hide end date options will hide these 2 fields on the new deal form and on the deal details. If the end date is required, then it will be displayed regardless of what is set here. You can choose to filter the publishing of the deals by enabling the Require approval option. With this, all deals will be unpublished upon being created and will require your approval from the Deals page. The Price length will set the length of the price field. 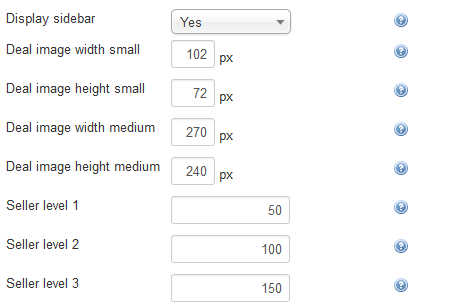 For example, by setting it the length to "4" users will be able to add the price as "9.99" or "9999". Each character means "one length". As a revenue stream for Webmasters, Micro Deal Factory comes with a commissioning system that allows you to keep a percent of the withdrawals requested by users. You can set an unique price for all deals on the website with the Deal price field. This will require the Type of price to be set as Unique price. Setting Type of price as Individual price will allow every user to add their own desired price to their deals. The used currency tab can also be set here, using the Deal Currency field. For every withdraw request made by users, you can keep a certain percentage of that value as a commission. Set this percent using the Withdraw commission field. The Min withdraw request is the minimum value a user can request a withdrawal for. Add the Symbol of the currency added above. If empty, the currency name will be used. From the Email Notifications tab you can enable, disable or edit the messages that are sent automatically for different actions. 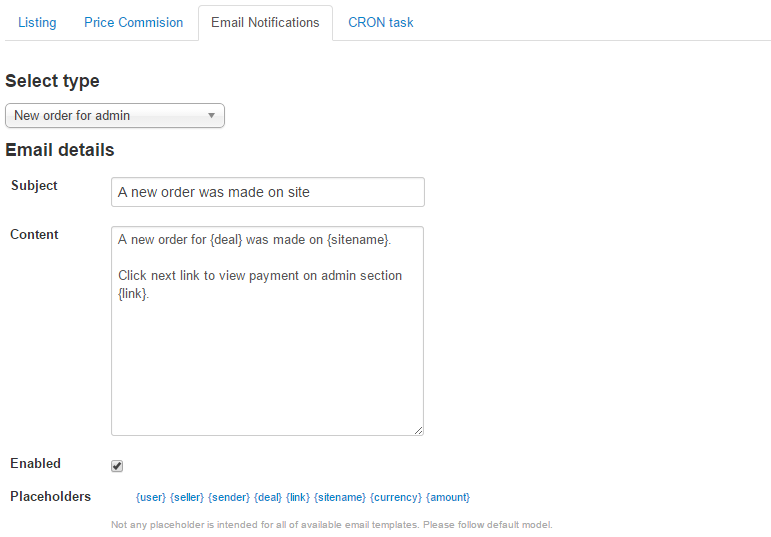 Admin - New order: Sent to admin when a new payment order was made. User - Received requested amount: Sent to user when he receives on his PayPal account the requested amount. User - Received new comment: Sent to seller when a new comment has been added on his posted deal. Admin - New withdraw request: Sent to admin when a new withdrawal request has been made. User - Sell new deal: Sent to seller when a new order is made for his deal. User - Send private message: Sent to user when he receives a new private message. Admin - Deal pending approval: Sent to admin when a new deal has been submitted which awaits approval. User - Order canceled: Sent to seller when the buyer has canceled his order. User - Deal new watchlist: Sent to user when a new deal was submitted by a seller from his watchlist. You can enable or disable just some of the messages by clicking on them from the drop-down menu and checking or unchecking the checkbox. If you want them all to be activated, please make sure that you verified them one by one! CRON allows you to run scheduled jobs that perform regular cleanups, backups or other scripts that need to run from time to time. 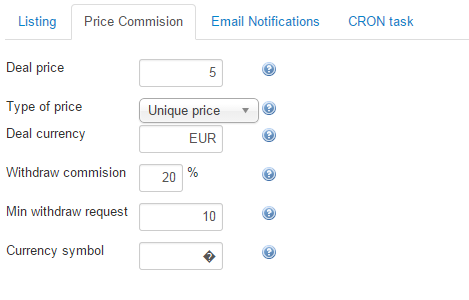 For Micro Deal Factory CRON will send notifications in order to inform sellers for all of their deals that expire the next day. On this page, you will find the access link of CRON. A field which allows you to change its password is also available. 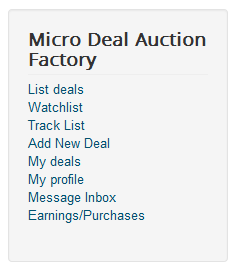 Micro Deal Factory's menu comes with various menu items that you can manage by adding or removing in the menu customization. List deals - Displays a listing containing all published deals. Watchlist - Displays a listing containing deals added as favorites by the logged in user. 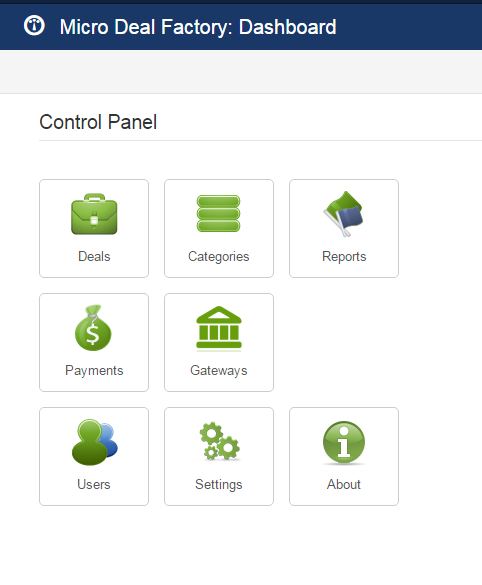 Track list - Displays a listing containing the paid orders of the logged in user. Add new deal - Displays a form where users can submit new deals to your website. My deals - Displays a listing of the deals added by the logged in user. My profile - Displays the place where users can view and edit their profile information. Message Inbox - Displays a list of all the messages received by the logged in user. Earnings/Purchases - Displays the page where users can withdraw funds and view a history of their deals purchased and orders received.